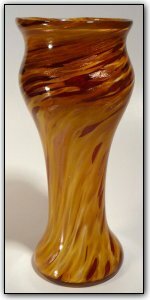 This vase features many shades of gold topaz, subtly changing intensity throughout. As a perfect compliment to the variety of shades of gold topaz, real gold adventurene also added was for some extra gold sparkle. The more light you shine on this vase, the more it sparkles!